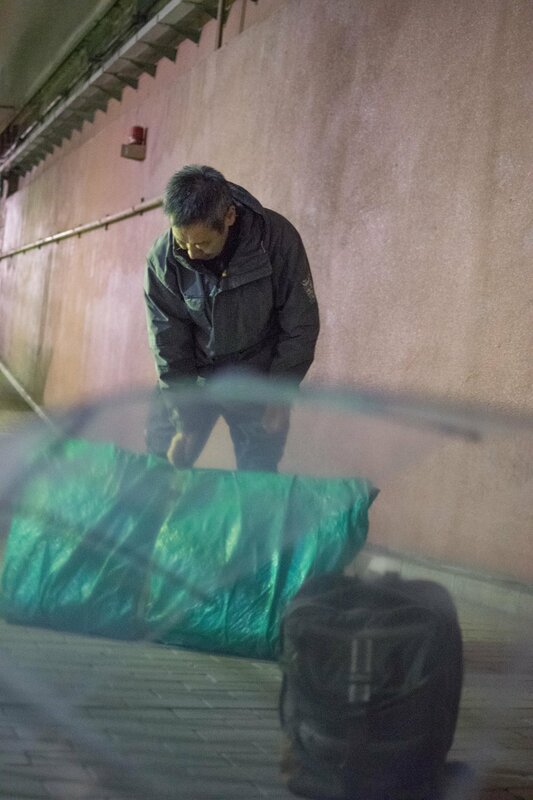 If you read my previous post, you’ll know that last week I spent 2 days with Matsuyoshi san – a homeless man in Tokyo on my second stint sleeping on the streets. I slept terribly on the first night and would hazard a guess that I managed half an hour of sleep, but felt surprisingly chipper the following day. As I mentioned in my day 2 post, it is the sounds of the city more than anything that really remind you where you are. Once my eyes were closed sound affected my sense of comfort in a big way and when sleeping outside in the city I felt immersed in what is going on around me aurally. I realised when I got home how cocooned I feel when I’m in bed, and the silence when I got back to my bed after these couple of days felt almost artificial – similar to the feeling of sleeping inside after a few days/weeks camping. I spent the whole of the next day (except for his working hours) with Matsuyoshi san. 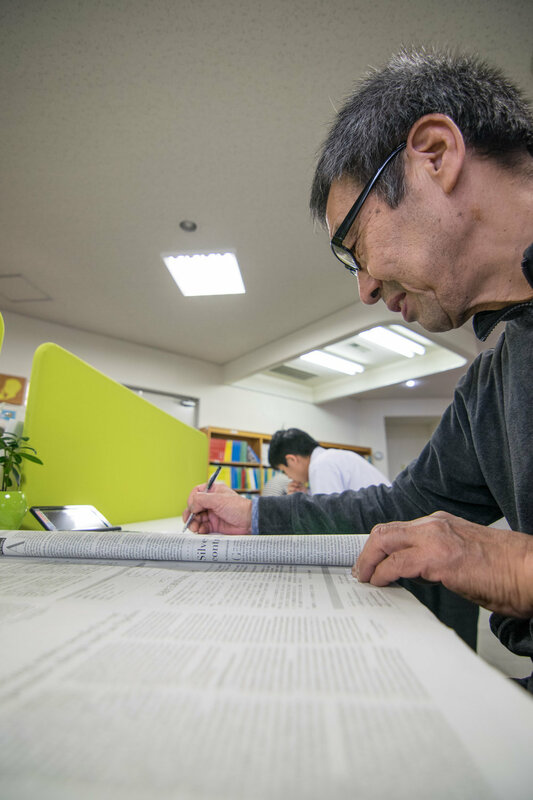 It takes time to get to know someone and as I spend more time with Matsuyoshi san I am learning more from him than I imagined I would – he is a generous, curious, intelligent and dignified person. He struggles when I offer to buy him breakfast and he insisted on buying me lunch in return, and also tried to force me to have a cup of tea at his expense at dinner time. 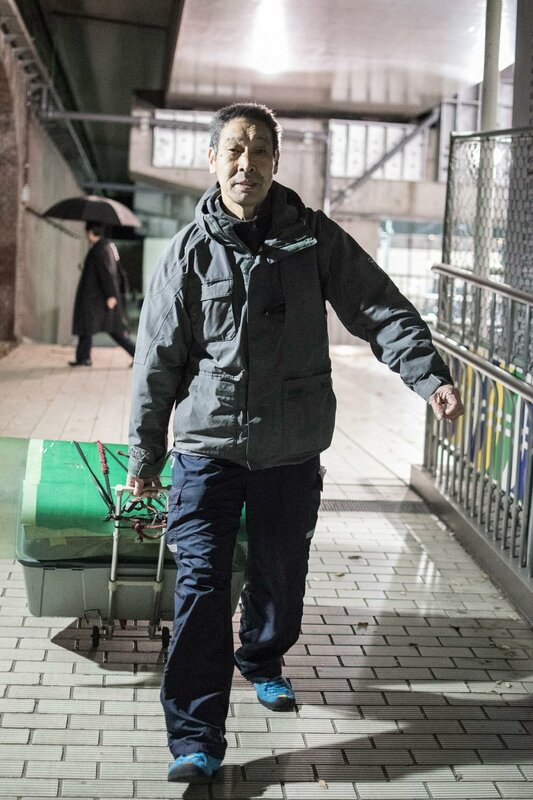 Matsuyoshi san seems to be very aware of the negative associations most people make of homeless people and I think that he feels himself to be somewhat worthy of this negative appraisal and counters it by being as dignified and respectful as he can. He cleans the area surrounding his box every morning and picks up rubbish on the streets, treating the streets as he would his own home. He doesn’t want hand outs and seems to take full responsibility for where he is in life. He isn’t ready to get off the streets yet, but plans to try to move on some time in the next few years. He told me that for him time is more important than money and he wants to do something with what he has left. One of his ambitions is to work as a volunteer tourist guide for the Tokyo Olympics in 2020. His English level is almost fluent and the prospect of working as a volunteer is giving him an incentive to study daily. 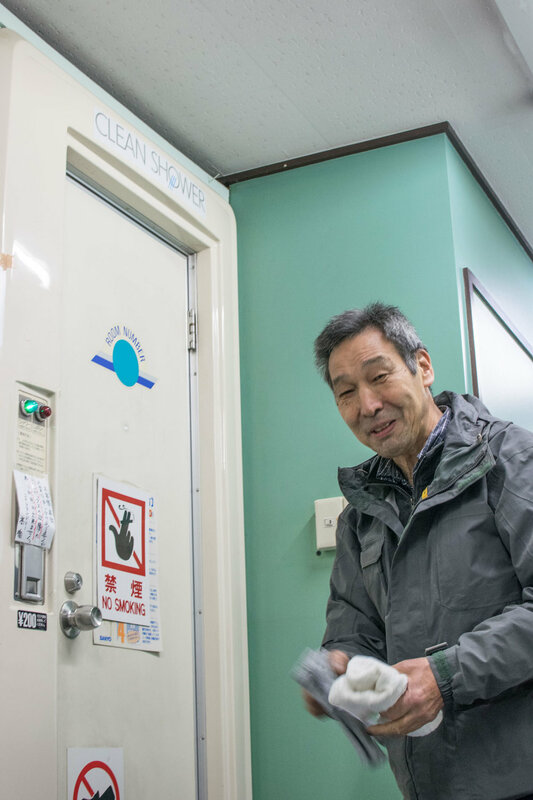 After spending a couple of hours in the library studying and reading the daily newspapers, I went with Matsuyoshi san and waited for him to have a ‘coin shower’ – a shower in a launderette which costs 200 yen for 7 minutes. 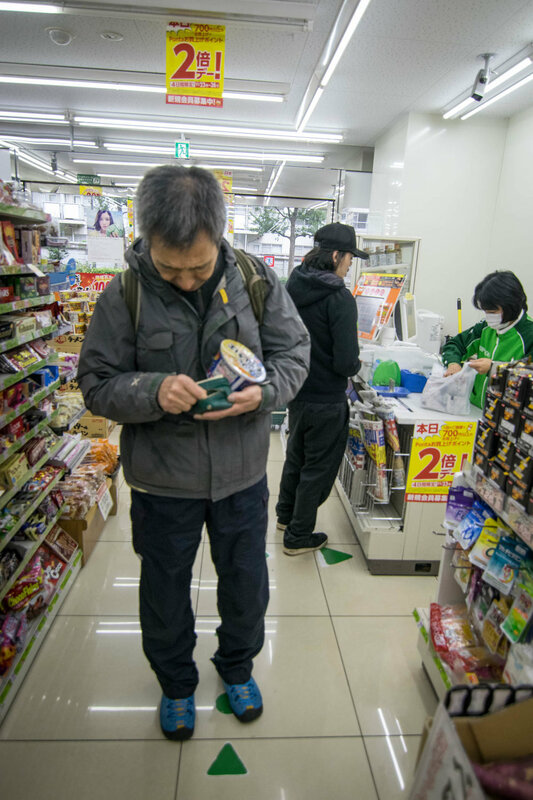 We then went to Lawson 100 (a convenience store where most products cost 100 yen plus tax) and bought a pack of instant noodles and a sweet potato each. He eats the same thing everyday, though in the summer it’s tofu instead of sweet potato. We then headed to Shinjuku park to eat, and chatted about the pros and cons of Japanese indirectness. Matsuyoshi san has strong opinions about the state of Japan and is distressed at the fact that young people are becoming increasingly less interested in foreign travel (according to a teacher at the high school I teach at this may have something to do with young people in Japan being less and less able to handle (social) stress and the imagined stress of foreign travel is too much to deal with and so staying in Japan seems like a more comfortable and safer option) and he ‘would like to tell young people to go out of Japan and see the world and mix with other cultures as it would solve a lot of the world’s problems if we all had first hand experience of other cultures’. After lunch and a warning from Matsuyoshi san that the combination of foods that we just ate is liable to give me bad wind, we parted company until 4pm, when he finishes his work. When we met again we went to the laundrette to wash some of his clothes and waited in McDonald’s. After leaving McDonald’s we headed to Gogo hiroba, an attractive outdoor square next to where Matsuyoshi san sleeps and his homeless friends gather to chat and eat snacks every evening. Minami san was missing and nobody knows where he is, all his stuff is gone too, but nobody seems alarmed as apparently it has happened before. The previous night was unseasonably warm, but today was a very different story. Snow was forecast for the following day and it felt like winter had finally arrived as the temperature suddenly dropped as night approached. There was a subdued feeling amongst the group when we arrived until Koshizawa san – another Sokerissa dancer who has recently acquired an apartment, but still comes out most nights, turned up after about 20 mins and the atmosphere livened up a little. He is a very charismatic guy with a good sense of humour and everyone including myself, was pleased to see him. As it was a national holiday we could set up our boxes a bit earlier, which seemed like an attractive proposition due to the almost arctic temperatures. So around 8pm we went to get our things and set up for the evening. Matsuyoshi san commented that in winter you just want to get into the box as quickly as possible. He covered his with two blankets this evening. My box just had a single thin plastic cover, but was warm enough inside and I slept much better than the previous night. I left in the morning and felt like my stay wasn’t long enough this time. I am very grateful to Matsuyoshi san for being so open, accommodating and helpful and am looking forward to next time. If you enjoyed reading this please click like below. I would also love to hear your comments, ideas and feedback. Thank you!